I really don’t like seeing the TV unless it is on. And then, often I still don’t want to see it. That’s right, I’m one of THOSE PEOPLE. I used to watch a lot of TV, really WAY TOO much. I knew everything that was going on. Now, I haven’t a clue. Friends often email to let me know if something big happens because they don’t I won’t see it. Sadly I get my news from Facebook. (Hanging head in shame.) If you watch TV, really, it’s okay by me. How much you watch or don’t watch TV isn’t going to make me like you any more or less. Okay, now down to business. 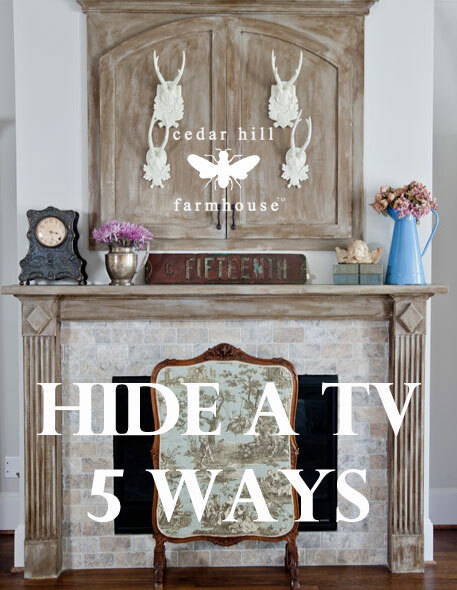 Here are the 5 ways I have hidden the TV’s in our house. 1. This was in the old house. We had a TV in the breakfast room. I hid it under this box. If you want to know how to make it, I show you here. 2. This antique pine armoire (now in our bedroom) held the TV at our old house. We actually got a 42 inch flat panel in there, so you can get a pretty big TV into one of these old armoires. Just make sure it will fit before you buy it, and make sure the piece is sturdy enough to hold the TV. The TV in here was a plasma, and it was about 100 pounds. 4. The other daughter also has a TV in here room. 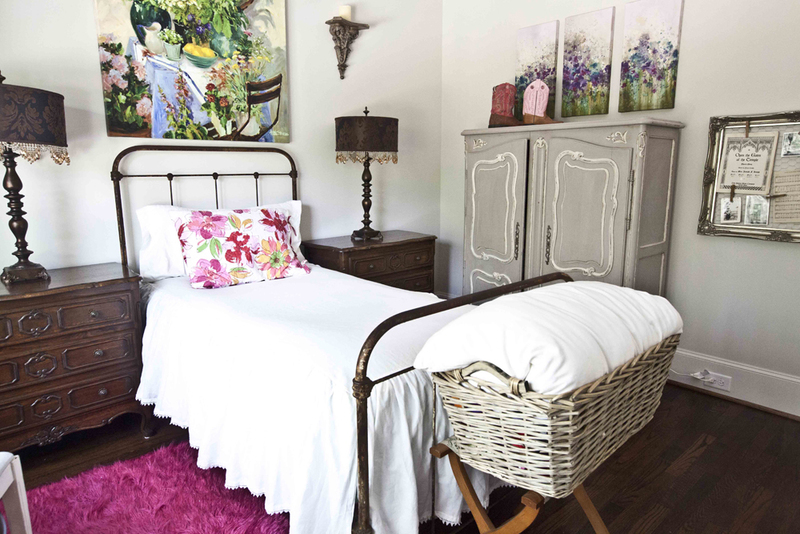 She and her babysitter sit in here, and have delicious snacks while the watch Novellas (Spanish soap operas.) Sometimes I get one of those snacks, yum. So this armoire can hold a bigger TV, but not a super big one. Now many of the large flat panel TV’s are just going to be too big to hide, and I like the use of a big buffet to hold those TV’s or they can look pretty great hung on a wall bracket. Obviously, the smaller the TV, the easier it is going to be to hide it. 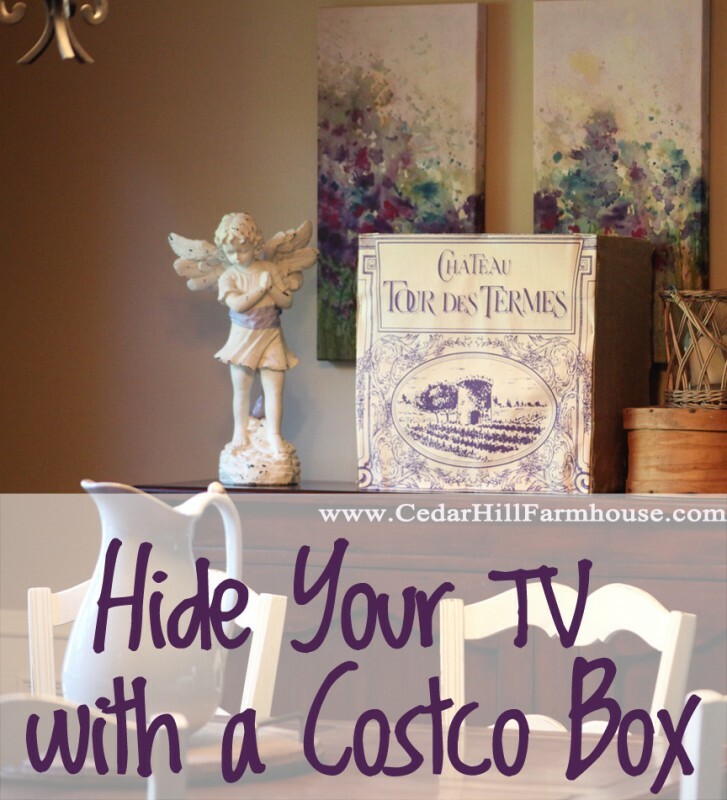 Love all these ways to hide those TV’s you know the things we can’t live without yet have the hardest time making them pretty lol! Love all these ways. So pretty. What wonderful ideas! I love them all. I heard that they are making mirrors that have a tv screen hidden inside. That would be great wouldn’t it? Every one looks so very pretty! I especially like how you hid the TV in the breakfast room- very creative solution! Thanks for sharing! All of these are beautiful but my top favorite is #5! The wood is absolutely Gorgeous!! The microwave is in the backside of our island. You can see it unless you are standing behind the island. I, too, never watch TV. The one show I do watch I watch the next day on my computer. But hubby is a television fanatic so I’ve made my peace with visible TVs. Still, absolutely love your solution with the built in cabinet. Looks wonderful! I also like armoires for TVs (but for me they need to be fitted with pocket doors because they’d likely be open 90% of the time when the family is around). Those are all great ways to hide a TV. 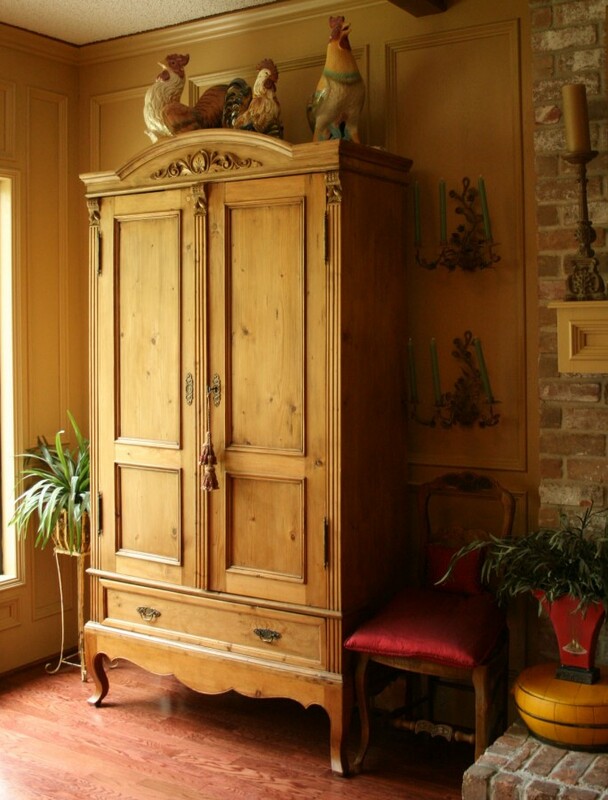 I had a huge armoire in our last house but my son confiscated it so….I now look at IT in our family room! The box is my favorite. Who would have thought. Love it. I don’t like TV’s showing either but don’t have much choice at the moment however, I do plan if we go ahead with our extension to put it over the fireplace and using something similar to your cabinet would be a great idea. I have seen they now do them in a mirror, it actually looks like a mirror but turns on at the flick of a switch and is a TV. Our TV is over our fireplace, but it would be so nice to have a cover over it, like in that last picture. My partner and I have been trying to figure out what to do and this may have just been a lifesaver! 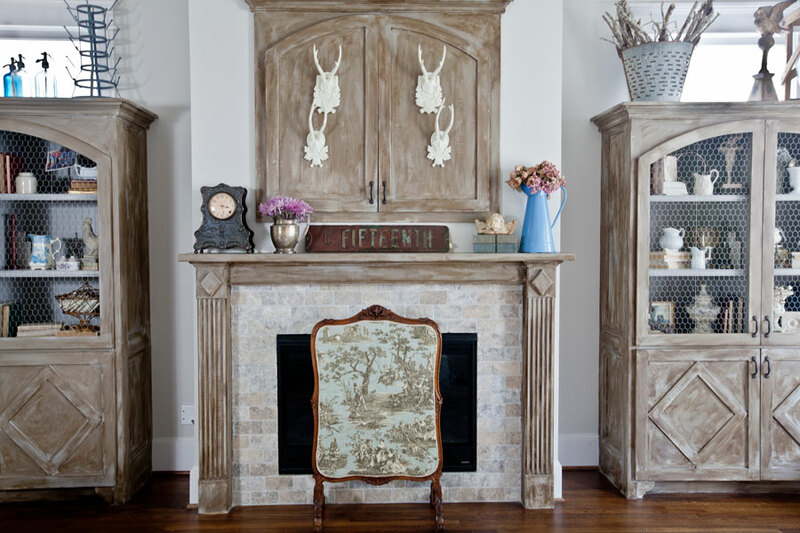 I especially love the one over the mantel ! You have the most beautiful pieces of furniture to “hide the TV” and have always admired the doors hiding the TV over the fireplace! 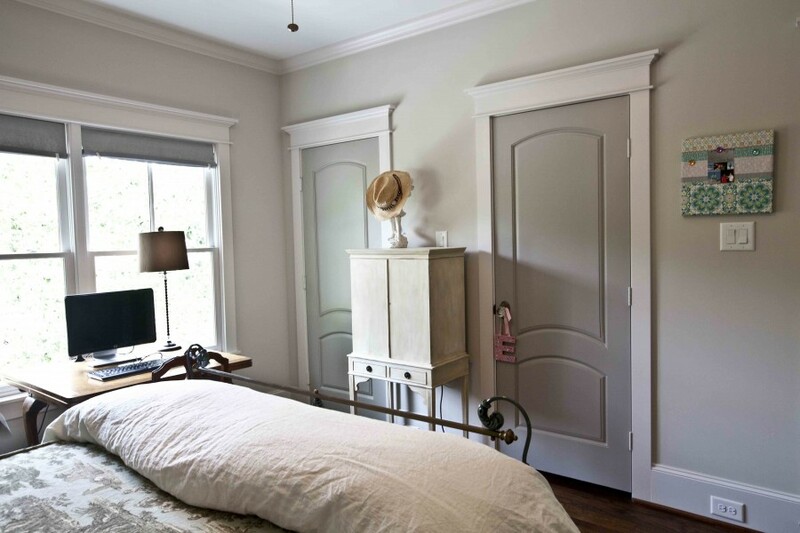 I have a similar looking armoire as the one you have in your bedroom, but the color is more yellowish. Did you use a stain or anything on yours to get that color? I want mine to look more natural like yours. Which armoire? Golly I have several so I am not sure which one you are asking about. But I don’t think I did anything to the stain on any of mine. I did paint a few though. The tall pine one in your current bedroom. Mine is solid pine as well, but looks yellowish. I was wondering if you did anything to yours to make it more warm or natural looking. It is beautiful! Pine is going to be yellow. As it ages it does seem to loose some of the yellow. This piece is an antique, but may look more yellow in person than in the photo. Some new pine pieces are a lot more yellow though. I didn’t do anything to it to change the color.